Go to most messianic gatherings and one of the first things you’ll figure out is that this faith group may single-handedly keep the slow-cooker industry in business. “Leviticus 11 kosher” maybe. Maybe. If you’re just going by which foods are allowed to be consumed by the children of Israel and which aren’t. And even then it’s questionable. Kashrut laws extend far beyond that chapter of the Bible. They’re sprinkled throughout the Torah. “Biblically kosher” is a safer claim. It’s intended to signal that “We don’t worry about the rabbinic/manmade kosher laws of the Jews.” Just avoid pork and shellfish, and you’re good to go. Or not, according to Aaron Eby, author of Biblically Kosher: Revealing the Sources of Dietary Laws in Judaism (First Fruits of Zion, 190 pages, $15). Keeping kosher according to Scripture is a lot more complicated than just avoiding pork and shellfish, Eby writes. He develops his argument very methodically, an Eby (and FFOZ) trademark, building from the most general matters (e.g., why keeping kosher is still an issue at all) to very specific matters by the end (keeping kosher in a messianic community). On the way, Eby (who blogs here on kashrut) lays out the case for the continued application of the kashrut laws found in Torah. He first has to respond to arguments that any of the laws given specifically to the Children of Israel were overturned when Messiah came. Eby builds his case by turning to such passages as Matthew 5:17-20, Deuteronomy 13:1-5 and Acts 15. He then deftly handles anti-kosher arguments found in interpretations of Mark 7 (where Jesus argues with Pharisees over handwashing and supposedly declares “all foods clean”), Acts 10 (Peter’s vision of the sheet and animals) and other passages in the Apostolic Scriptures. In fact, Eby’s handling of Mark 7 is the clearest explanation I’ve ever read of that passage. Tim Hegg discussed it also in his Why We Keep Torah: Ten Essential Questions course, but in a much more complex manner that wasn’t wholly satisfactory. Eby drives home the point that a proper understanding of purity laws is essential to understanding the Master’s teaching here. Again, Eby prowls through this topic carefully and thoroughly, as he does the milk-meat-mixture topic. Whether someone keeping kosher should also abstain from mixing meat and dairy products in dishes and even at the same meal has long been regarded as “a classic example of a non-biblical rabbinic ruling.” Eby shows, however, that it’s a legitimate interpretation of the verses stating that “You shall not boil a young goat in its mother’s milk” (Exodus 23:19 and 34:26, and Deuteronomy 14:21). He does not, though, make a definitive statement on whether he believes milk and meat should be kept separate, instead laying out the evidence and letting the reader decide. He finally discusses the issues raised in messianic communities, and argues for “an atmosphere of diversity of practice and mutual acceptance.” Messianic believers are notorious for coming up with individual standards or being critical of those with higher or lower standards than they have. Eby says that one should both respect the other’s level of kashrut while at the same time striving to maintain table fellowship. Biblically Kosher is a useful and needed guide in today’s still-young messianic movement. 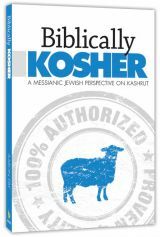 It brings balance and clarity to the discussion of kashrut, and should be a step toward greater observance of biblical law by both Jewish and Gentiles believers in the Messiah. Hopefully, it’ll also be food for thought at those starchy messianic onegs. Mike Miller also blogs at Voices of Faith.